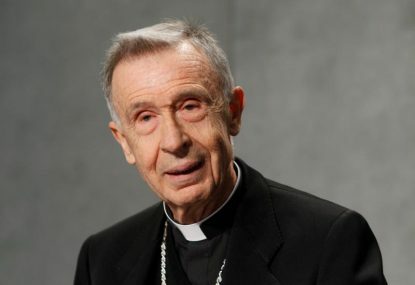 VATICAN CITY (CNS) — When he was named secretary of the Vatican’s doctrinal congregation, Cardinal-designate Luis F. Ladaria Ferrer marveled at being unexpectedly thrust into the limelight. Since then, the Jesuit prelate has had his share of surprises, which culminated in his appointment as prefect of the Congregation for the Doctrine of the Faith and now as a cardinal. He entered the Jesuits in 1966 and, after studying theology and philosophy in Spain and Germany, he was ordained to the priesthood July 29, 1973. As someone who “liked studying,” the Spanish prelate went on to earn a doctorate in theology from the Pontifical Gregorian University in Rome in 1975 and began teaching dogmatic theology at the Pontifical University Comillas in Madrid. Nine years later, he returned to the Gregorian to teach, and he served as vice rector of the university from 1986 to 1994. “The Gregorian taught me to live in an international environment with students from over 100 countries, of different languages, races and cultures. All united by the love of study, but above all, of the Lord and his church. In a real university, students not only learn from professors, but also the reverse occurs. And I learned a lot from my students,” he said. Cardinal-designate Ladaria also said his time in Rome as a professor shaped his view on handling church issues that often can be used to advance extremist agendas, both on the left and the right. Pope Benedict XVI named him an archbishop and appointed him secretary of the doctrinal congregation after having worked with him as a member of the International Theological Commission from 1992 to 1997, as a consultant to the doctrinal congregation from 1995 to 2008 and as secretary general of the theological commission from 2004 until being named congregation secretary. Pope Francis named Cardinal-designate Ladaria prefect of the congregation in 2017. As prefect, he is responsible for promoting the correct interpretation of Catholic doctrine and theology; his office also is responsible for conducting investigations of clergy accused of sexually abusing minors. “Pope Francis called me and told me his decision, and I said: ‘Holy Father, if that’s what you have decided, I accept and say no more,'” he said in an interview with Vatican News March 10. “Many times, I heard Pope Benedict XVI — when he was Cardinal Ratzinger and prefect of the congregation — say that ‘we must defend the faith of simple believers, not the faith of theologians,'” he told Vatican News.